Whither Graph Theory? (W.T. Tutte). The Future of Graph Theory (B. Bollobás). New Directions in Graph Theory (with an emphasis on the role of Applications) (F.S. Roberts). A Survey of (m,k)-Colorings (M. Frick). Numerical Decks of Trees (F. Gavril et al.). The Complexity of Colouring by Infinite Vertex Transitive Graphs (B. Bauslaugh). Rainbow Subgraphs in Edge-Colorings of Complete Graphs (P. Erd&odblac;s, Z. Tuza). Graphs with Special Distance Properties (M. Lewinter). Probability Models for Random Multigraphs with Applications in Cluster Analysis (E.A.J. Godehardt). Solved and Unsolved Problems in Chemical Graph Theory (A.T. Balaban). Detour Distance in Graphs (G. Chartrand et al.). Integer-Distance Graphs (R.P. Grimaldi). Toughness and the Cycle Structure of Graphs (D. Bauer, E. Schmeichel). The Birkhoff-Lewis Equations for Graph-Colorings (W.T. Tutte). The Complexity of Knots (D.J.A. Welsh). The Impact of F-Polynomials in Graph Theory (E.J. Farrell). A Note on Well-Covered Graphs (V. Chvátal, P.J. Slater). 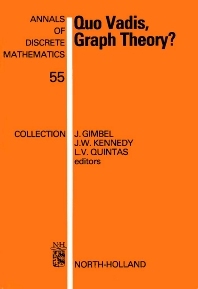 Cycle Covers and Cycle Decompositions of Graphs (C.-Q. Zhang). Matching Extensions and Products of Graphs (J. Liu, Q. Yu). Prospects for Graph Theory Algorithms (R.C. Read). The State of the Three Color Problem (R. Steinberg). Ranking Planar Embeddings using PQ-Trees (A. Karabeg). Some Problems and Results in Cochromatic Theory (P. Erd&odblac;s, J. Gimbel). From Random Graphs to Graph Theory (A. Ruci&nacute;ski). Matching and Vertex Packing: How Hard are They? (M.D. Plummer). The Competition Number and Its Variants (S.-R. Kim). Which Double Starlike Trees Span Ladders? (M. Lewinter, W.F. Widulski). The Random f-Graph Process (K.T. Bali&nacute;ska, L.V. Quintas). Quo Vadis, Random Graph Theory? (E.M. Palmer). Exploratory Statistical Analysis of Networks (O. Frank, K. Nowicki). The Hamiltonian Decomposition of Certain Circulant Graphs (J. Liu). Discovery-Method Teaching in Graph Theory (P.Z. Chinn). Index of Key Terms. Graph Theory (as a recognized discipline) is a relative newcomer to Mathematics. The first formal paper is found in the work of Leonhard Euler in 1736. In recent years the subject has grown so rapidly that in today's literature, graph theory papers abound with new mathematical developments and significant applications. As with any academic field, it is good to step back occasionally and ask Where is all this activity taking us?, What are the outstanding fundamental problems?, What are the next important steps to take?. In short, Quo Vadis, Graph Theory?. The contributors to this volume have together provided a comprehensive reference source for future directions and open questions in the field.